Vacation Rentals in Avalon California, Catalina Island Vacation Rentals offers the largest selection of vacation lodging on Catalina Island. With over 200 privately owned properties, ranging from our beautiful villas at Hamilton Cove to quaint cottages, we have houses and condos in the charming resort village of Avalon, California. 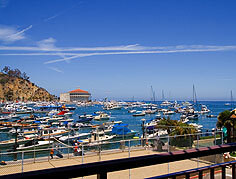 Our unique Catalina Island rentals are designed to make you feel more at home. Our rental homes have exceptional views of either the mountains or the ocean. Look through our website, and then call and let one of our professional reservation agents help you plan one of the finest getaways you'll ever experience. Perfect weekend fun for Los Angeles, Orange County and Southern California residents.